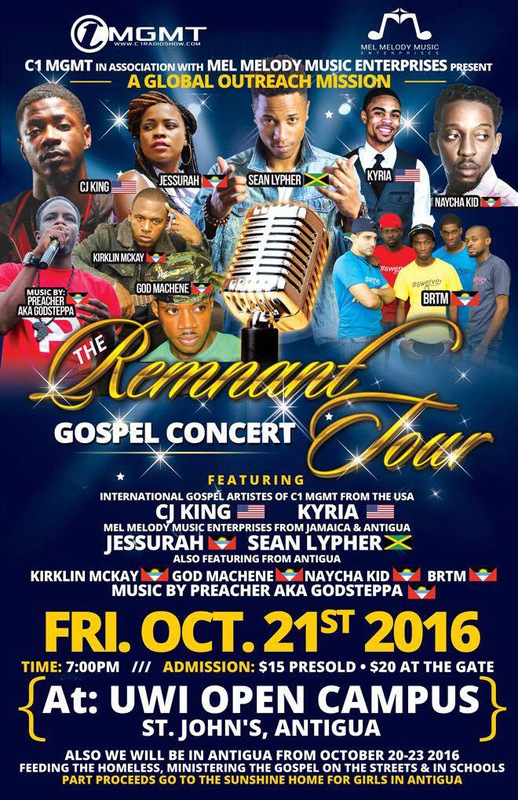 C1 MGMT in the United States, in association with Mel Melody Music Enterprises in Jamaica, are excited to announce a Global Tour, called “The Remnant Tour” (2 Kings19:30). This special international event will begin in October 2016 in St. John, Antigua and run through 2017. 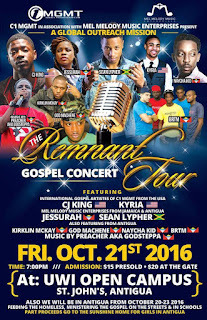 The first event will be held Fri. Oct. 21 at UWI Open Campus in Antigua and will feature C1 MGMT Artistes; CJ King and Kyria from the United States and Mel Melody Music Enterprises Artistes; Sean Lypher, Jessurah and Disc Jock, Kenneth (GodSteppa) Brown. It will also feature Kirklin McKay, God Machene, BRTM and Naycha Kid; Artistes from Antigua. “The Remnant Tour” is not just about music. Those participating will also be feeding the homeless in each location and ministering in the streets and in the schools. A part of the proceeds from the Fri. Oct. 21st event will go to the Sunshine Home for Girls in Antigua. Melisa’s and C1’s love for music, passion for writing and zeal for the Gospel of Christ to reach the four corners of the world breathe life into this endeavor. Melisa has always had a bigger vision of being a Humanitarian and aiding the lost and hungry. God has finally brought her passions together and her vision to life with The Remnant Tour. Starting out as a graphic design and music production company, later evolving to the Radio and TV platforms. Our goal is for our audience to have a fascinating experience through alternative Christian programming. We strive to inspire, inform and entertain our audience making a positive difference in their lives every day. We believe in challenging the status quo. We do not believe in doing different things, rather in doing things differently. We achieve this by providing our audience with a broad range of relevant Christian media. The C1 brand is synonymous with creativity and originality throughout various arenas from speaker to screen to mobile devices. We are convinced that the public wants more content that they can relate to. By remaining on the cutting edge of content creation and practicality, C1 will continue to listen, learn, and provide quality programing available at anytime, anywhere. We at C1 Management believe in preserving the excellence in ministry. In that we take your gift and help you groom it to where God wants you to be in excellence. Mel Melody Music Enterprises, Owned and Managed by Melisa (Mel Melody) Dyce, first launched as a Public Relations and Social Media Marketing Company, solely for Ministers of the Gospel in November 2015. It was first named, Mel Melody Music Marketing; which was long lived. The company is based in Jamaica but does not restrict its services to Natives only. Upon the growing requests for her services, she took the great advice given and started her own company after marketing for many Artistes under their umbrellas since early 2014. Her work and writing abilities were noticed by many and she was then asked to take on other tasks by Gospel Artistes, Producers, and even Radio Stations; including Event Planning and Artiste Management. She took the bull by the horns. Melisa could no longer limit her company to Marketing and advertise it by its former name. Hence, emerged the new revised name, Mel Melody Music Enterprises.